Sony has announced the PlayStation Classic, a miniaturised games console that comes pre-loaded with 20 original PlayStation games and also includes two controllers out of the box. The console, which is launching in time for Christmas 2018, follows the Nintendo NES Classic Mini and SNES Classic Mini, in offering a plug-and-play mini console that works with any HDMI port-toting TV or monitor. The PlayStation Classic is 45 per cent smaller on the sides than the original PlayStation, and a whopping 80 per cent smaller in volume. The PlayStation Classic launches on December 3, 2018. The cost of the PlayStation Classic in the UK is £89.99 ($99.99 in the US). Multiple versions of the PlayStation Classic will be offered on launch depending on which territory the system is sold in, with International and Japanese versions confirmed so far. The PlayStation Classic can be pre-ordered right now. In the UK the console can be pre-ordered from Amazon, GAME, and ShopTo. In the US the PlayStation Classic can be pre-ordered from BestBuy. The PlayStation Classic's designed is near-identical to the original PlayStation, however this version of the console is 45 per cent smaller than the original, and comes packing a HDMI output for ease of use with modern TVs. 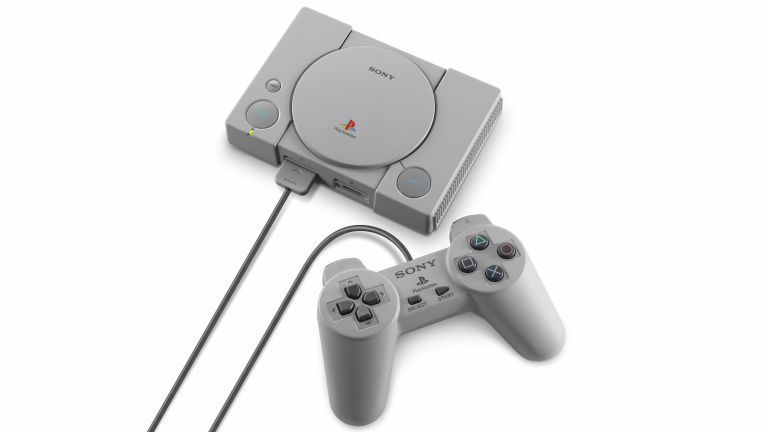 The PlayStation Classic is powered by USB cable, meaning that any port capable of 5W out, or via a USB-to-AC plug, is capable of powering the console. Video output can be switched between two resolution modes, 720p (1,280 x 720) or 480p (640 x 480). The PlayStation Classic comes with two controllers out of the box, which are identical in design (aside from their USB connectors) to the original PlayStation Controller. In terms of games, the PlayStation Classic has been confirmed as coming with "20 classic titles", however as of the time of writing only 5 of these have so far been announced by the Japanese maker. These games are: Final Fantasy VII, Jumping Flash, Ridge Racer Type 4, Tekken 3, and Wild Arms. Sony has confirmed that the system's additional games will be announced on the PlayStation Classic's official web page over the coming weeks. We haven't got our hands on the PlayStation Classic yet and, as such, it is hard to judge just how good the system is. £89.99 certainly isn't cheap, so we're hoping that the build quality of the console and its controllers doesn't feel bargain basement, and we're also hoping that the video and audio output is clean. Most importantly, though, we really can't wait to see what the other 15 games included on the system are, as that will definitely be a make or break factor for us in terms of how the system scores. We also haven't seen the PlayStation Classic's user interface or menu options yet (can we customise video or audio output options, for example), so while the console shows promise, right now we feel it is too early to provide even a tentative verdict.